Lately, I've been finding that when I'm stamping large focal points, the rest of my card can quickly start to suffer from a lack of attention. Any of you been there too? 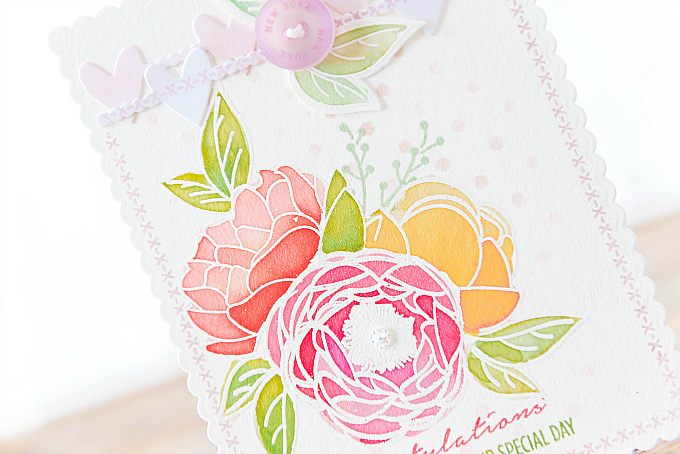 What I mean by this, is that I'm so intently focused on coloring the pretty flowers, picking just the right sentiment, or thinking about topper details, that when I look around the card, the rest of it just seems so empty and neglected. Now I will be the first to admit that I looove white space. It really allows beautiful focal points to shine. But sometimes all that white can be overwhelming and I can find myself at a loss of how to make the white space appear just a tad less white. I've been playing with adding in a soft detail (or two) to bring my cards to life, without losing that white space feeling. And I thought it would be fun to share here with you my go-to way of doing this. I started this card by cutting out a scalloped card base with these beautiful Lawn Fawn Scalloped Rectangle Stackable dies (which just so happen to be on sale right now!). 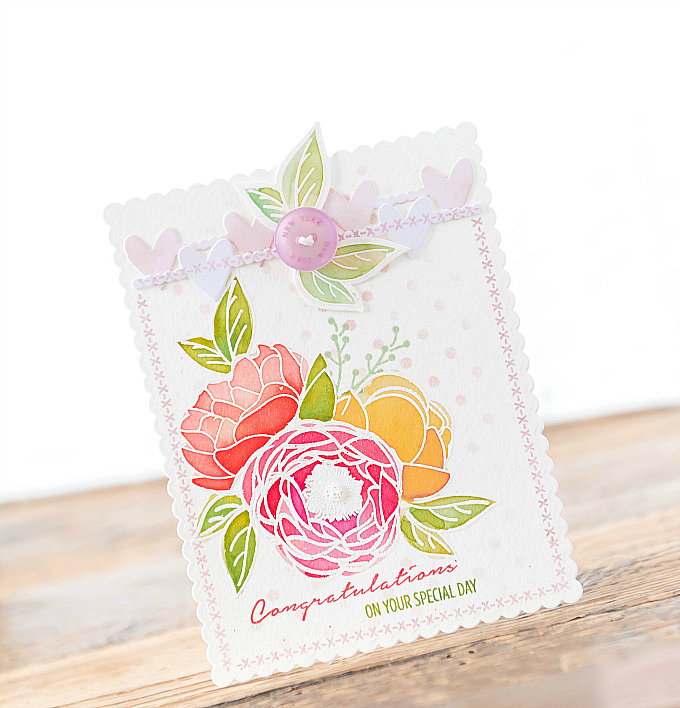 I then used a masking technique, stamping and heat embossing some beautiful blooms and leaves, from PTI's Peonies on Parade stamp set. I used Distress Ink to color the blooms and leaves, in colors of Candied Apple, Picked Raspberry, Fossilized Amber, Cracked Pistachio, and Shabby Shutters. This is where I realized that the rest of the card seemed rather empty, and decided to pull out some stencils and my ink blending tool, to see if I could add some interest to the background, without losing all the beautiful white space. 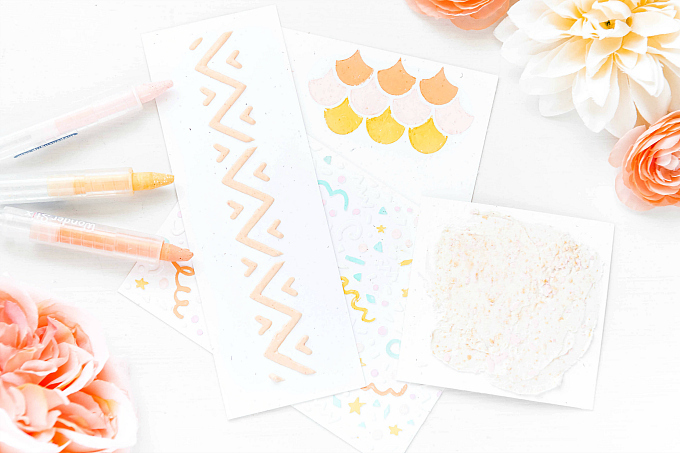 I stumbled upon my dotted Tim Holtz Polka Dot stencil and decided that it would do the trick! I used Sweet Blush ink for the dots because it's such a soft, sweet color, and not too overpowering. After finishing up with the stencil, I still felt that the background could use a touch of detail. 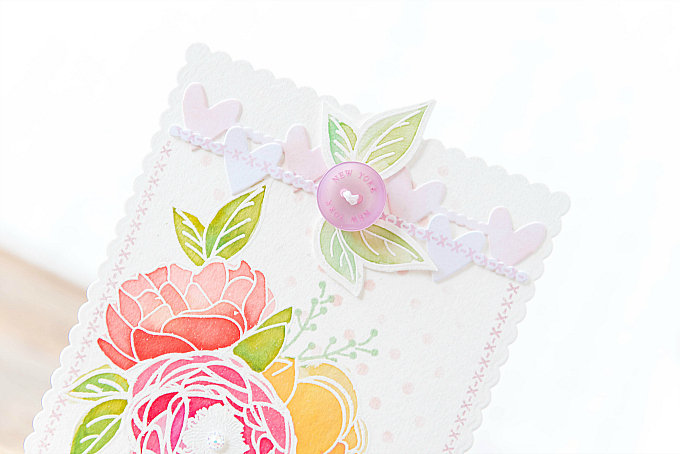 So I pulled out the Thanks stamp set by Precious Remembrance, and stamped a fine stitched border around the scalloped card with Lovely Lady ink. I really, really adore this stamp set and after all these years, it's still one of my favorite go-to's. At the top, I added some hearts with the Confetti Garlands die, some inked and some plain white. I added a few more stamped and colored leaves, along with a stitched button. For the sentiment, I used Candied Apple and Shabby Shutters Distress ink. I am such a fan of how this turned out! 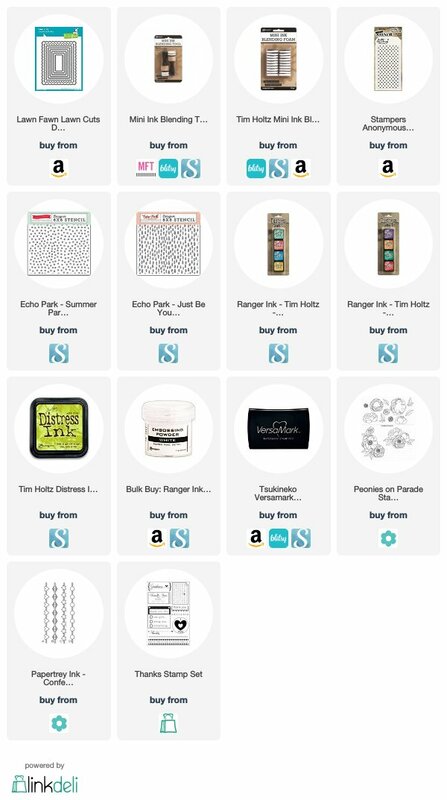 I really do need to rely on my stencils a bit more - I've included some of my current favorites at the bottom. They are so versatile and I love that color can be applied softly to give backgrounds just that little something-something. And I really should invest more into edging stamps, because, they too, are just perfect for this technique! As always, thanks for joining me today, Friends. Wishing you all a wonderful weekend. This is feminine and just dreamy!! Beautifully done Ivana! Even though this card does not have many layers as we are used to seeing on your gorgeous cards, it is still striking and beautiful! 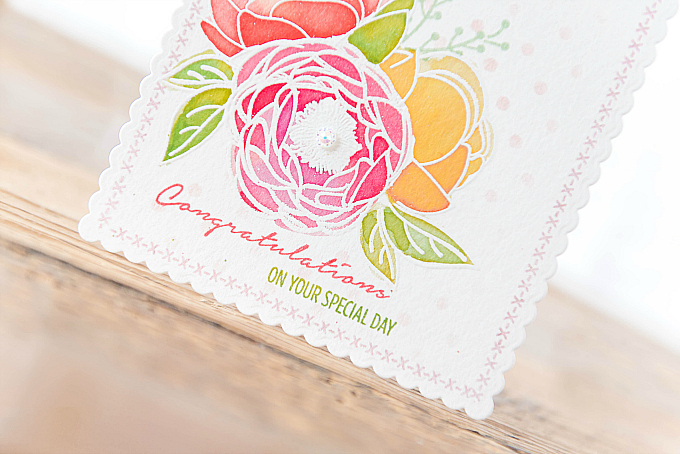 I am not into stamping and coloring but I sure do appreciate seeing gorgeous stamping and coloring work.